CHICAGO February 5, 2019; Nissan today unveiled a new 2019 Pathfinder Rock Creek Edition, which goes on sale this spring with a package price of $995.1 The Rock Creek Edition special value package offers unique exterior and interior treatments that emphasize the rugged Pathfinder heritage. "The Rock Creek Edition name was chosen to connect to Pathfinder’s family outdoor adventure-minded target customers," said Scott Shirley, vice president, CMM & Marketing Operations, Nissan North America, Inc. "By offering the Rock Creek Package on a range of grades, drivetrains and colors, buyers are able to customize their Pathfinders to their precise tastes." The big news for the 2019 Pathfinder is the introduction of the new Pathfinder Rock Creek Edition, a special value option package offering unique exterior and interior treatments that emphasize the rugged Pathfinder heritage. It is offered on Pathfinder SV and SL grades, in both 2WD and 4WD configurations, with two additional equipment packages and in a choice of seven available exterior colors – allowing buyers to customize their Pathfinder to their precise tastes. The Rock Creek Edition name was chosen to connect the vehicle to Pathfinder's family outdoor adventure-minded target customers. The Rock Creek Edition name also connects to Pathfinder's proud rugged heritage. Key differences between the Rock Creek Edition and standard 2019 Pathfinders include unique dark 18-inch wheels with unique 255/60R18 all-season tires, black mesh grille, black roof rails, black door handles and outside rearview mirrors, black front and rear fascia accents and license plate finisher, black molded overfenders, and black model, grade and 4WD badges (if so equipped) and unique badging on the front doors. Every Rock Creek Edition also features a standard trailer tow hitch and harness and splash guards. Both 4WD and 2WD Pathfinder models feature best-in-class1 6,000-pound towing capability. 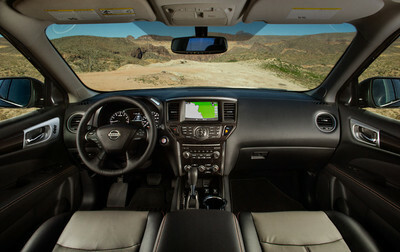 In addition, the new SV Rock Creek Edition Technology Package includes NissanConnect® with Navigation and Services, SiriusXM® Traffic, NissanConnect Services powered by SiriusXM®2 (SiriusXM subscription required, sold separately), heated cloth front seats, heated steering wheel and heated outside rearview mirrors. The new SL Rock Creek Edition Premium Package adds Bose®3 13-speaker Premium Audio System and Power Panorama Moonroof. In addition, all 2019 Pathfinder models continue to offer standard Automatic Emergency Braking (AEB) and Nissan's innovative Rear Door Alert (RDA)4 system, which can help remind customers of items that may be forgotten in the rear seat. The Rear Door Alert system is designed to help remind customers of items that may be forgotten in the rear seat. The system detects if a rear door is opened prior to driving, and if it is not opened again at the end of the trip, the system can remind customers that something might be left in the rear seat. RDA – the industry's first system that uses the horn in addition to door sensors and a message display on the center instrument panel – is designed to be simple, unobtrusive and can be easily turned on or off as needed. The seven-passenger 2019 Pathfinder is offered in 2-wheel drive and 4-wheel drive configurations and a choice of four well-equipped grade levels: S, SV, SL and Platinum. The Nissan Pathfinder, one of company's best known and most popular nameplates in its 60-year plus history in the United States, continues to offer a unique combination of rugged design, powerful performance, easy access for all seven passengers and a long list of standard and available innovative features and advanced technologies. It's the perfect way for families to turn up the adventure, around town or on and off the road. The popular Pathfinder was reborn for the 2017 model year with more adventure capability – including a freshened exterior look, adding a stronger sense of adventure, character and presence and continued fine-tuning of aero efficiency. The design continues in 2019 with Nissan signature design elements such as the "V-Motion" grille and boomerang-shaped headlights with LED daytime running lights. LED headlights are standard on the Pathfinder SL grade. Other exterior elements include an aggressive hood, front bumper and available fog lights. The outside rearview mirrors include standard integrated turn signals. In addition, aerodynamic optimization efforts include the grille design with enhanced cooling performance (negating the need for an active grille shutter) and a front chin spoiler design that directs air downward without compromising the approach angle for off-road driving. These details help optimize air flow around and below the Pathfinder exterior, which has a coefficient of drag of 0.335. Pathfinder SL and Platinum grades feature a Motion-Activated liftgate with liftgate position memory. A simple wave of the foot under the center of the liftgate activates the power opening function. Other exterior details include recessed front windshield wipers, roof rails, chrome door handles and privacy glass. An available Dual Panorama Moonroof is standard on the Platinum grade. It includes a sliding opening front panel and fixed rear glass panel, which extends over the 2nd and 3rd rows. Available Rock Creek Edition exterior features, including black molded overfenders, black mesh grille, black roof rails, unique lower front fascia, black door handles and outside rearview mirrors, black front and rear fascia accents and license plate finisher, black model, grade and 4WD badges (if so equipped) and unique "Rock Creek" badging on front doors black badging. Nine exterior colors are offered: Magnetic Black Pearl, Brilliant Silver Metallic, Gun Metallic, Pearl White Tricoat (premium color), Glacier White, Caspian Blue Metallic, Scarlet Ember Tintcoat (premium color), Midnight Pine Metallic and new Mocha Almond Pearl. Inside, the 2019 Pathfinder offers an array of new-generation information technology. The standard Advanced Drive-AssistÔ Display (ADAD), located in the center of the instrument display between the tachometer and speedometer, features a range of infotainment and driver assistance displays. Voice recognition is enhanced with HD microphone. The standard 8.0-inch touch-screen monitor, mounted in the middle of the instrument panel, provides intuitive interaction and control of a variety of driver-selectable vehicle systems and settings – including the standard NissanConnect® with Voice Recognition for audio, Bluetooth® and vehicle information. In addition, the available NissanConnect Navigation system2 (offered as standard equipment on Pathfinder SL and Platinum, optional on SV) includes Voice Recognition for navigation, including one-shot voice destination entry and three years of included SiriusXM® Traffic®. The Pathfinder also includes standard SiriusXM® Travel Link2 with three years of complimentary service, featuring sports, movie listings, stock prices, gas prices and weather. NissanConnect Services powered by SiriusXM®2 features automatic collision notification, emergency call and stolen vehicle locator, customizable alerts, dealer service scheduling and maintenance alerts. It comes standard on SL and Platinum grade. As in previous years, the 2019 Pathfinder's 3-row/7-passenger interior combines comfortable seating with the cargo capacity that families need every day. It offers the benefits of a mid-size crossover with the comfort of a larger SUV, including a flat floor for enhanced interior packaging flexibility and ample space. Every Pathfinder interior is anchored by Nissan's innovative EZ Flex Seating System™ with LATCH AND GLIDE™, a 2nd row tilt and glide seat that allows easy 3rd row access with a child safety seat remaining securely in place (on the passenger curb side)5. A wide range of seating and cargo carrying combinations are available with the 2nd row 60/40-split seat with manual slide/recline/fold flat and 3rd row 50/50-split seat with manual recline/flat fold. Cloth seat fabric is standard for S and SV grades, while leather-appointed seating is standard on SL and Platinum models. And, as needed by today's drivers, six USB ports are standard – two USB type-C, four USB type-A ports. Pathfinder's quiet, comfortable interior also includes a wide range of available features, including two rows of rich leather-appointed seating surfaces, heated and cooled front seats, heated 2nd row seats, heated steering wheel, power tilt and telescoping steering wheel, Nissan Intelligent Key®, Remote Engine Start6, multiple user memory settings and an advanced Bose® Audio System with 13 speakers. Pathfinder also offers available Intelligent Around View® Monitor (I-AVM). Other available technology includes Tri-Zone Automatic Climate Control, Bluetooth® Hands-free Phone System and iPod® integration. The Mobile Entertainment system includes 2nd row head restraint-mounted DVD display screens. The 8-inch QHD rear displays include auto brightness control and USB and HDMI rear source inputs. The rear display can be easily controlled from the front with a user-friendly display. An available Remote Engine Start6 function allows the climate control system to warm up or cool down the interior prior to driving (standard on SV, SL and Platinum). The Tire Pressure Monitoring System (TPMS), available with individual tire pressure display, comes with standard Easy-Fill Tire Alert that provides both visual and audible signals to help owners conveniently maintain correct tire pressures without the use of a gauge. The Rock Creek Edition adds unique seating surfaces and badging, high contrast stitching on seat, door, console lid and steering wheel and premium metallic interior trim. As part of its highly capable adventure credentials, every 2019 Pathfinder comes equipped with a 3.5-liter V6 engine with Nissan's Direct Injection Gasoline™ (DIG) system. Also utilized on the flagship Nissan Armada full-size SUV, DIG provides better wide-open throttle performance and improved fuel economy and emissions performance (versus a non-direct-injection system). The engine also utilizes mirror bore cylinder coating to help reduce engine weight by around three pounds and reduces friction between the piston ring and the cylinder wall (versus heavy cast iron cylinder liners). Horsepower is rated at 284 hp and torque is rated at 259 lb-ft. Pathfinder fuel economy7 is 20 mpg city, 27 mpg highway and 23 mpg combined for 2WD models; 19 mpg city, 26 mpg highway and 22 mpg combined (21 mpg Platinum) for 4WD models. All 2019 Pathfinder models are equipped with Nissan's advanced Xtronic transmission (similar to that utilized in the sporty Nissan Maxima). The Xtronic transmission includes D-Step Logic Control, which simulates shifts, giving a more natural acceleration feeling. Standard maximum towing capacity is a best-in-class1 of up to 6,000 pounds, giving owners the ability to tow two-axle recreational trailers, whether for watercraft, flatbeds or campers. The advanced Xtronic transmission design, with standard oil cooler, helps keep engine rpm optimized while towing without the typical "hunting for a gear" feel. As in previous years, Pathfinder also features selectable 2WD, Auto or 4WD Lock modes from the available Intelligent 4x4 (I-4x4) 4WD system. With the available intuitive four-wheel drive, Pathfinder continues to serve as an excellent vehicle for inclement weather driving conditions. Pathfinder also features selectable 2WD, Auto or 4WD Lock modes for its available Intelligent 4x4 (I-4x4) 4WD system. The system lets the driver choose full-time 2WD for maximum fuel economy, Auto mode to automatically monitor conditions and adjust the balance of power between front and rear wheels for best traction, or 4WD Lock mode when full-time 4WD is desired. In addition, standard Hill Start Assist helps prevent loss of control when starting and driving away on a steep incline (both 4WD and 2WD models), while standard Hill Descent Control (4WD only) helps by adjusting speed and brake pressure when traveling slowly down steep, rough terrain grades. Pathfinder's 4-wheel independent suspension also contributes to the enhanced driving dynamics, offering improved body control and a more refined ride. Rebound springs are added to the front struts to help assist with roll balance and body control. The result is the Pathfinder remains flat while cornering and road vibrations are well controlled, especially on rough roads and during off-road driving. In addition, a hydraulic electric steering system provides solid cornering feedback and feel. Pathfinder's advanced driver assistance technology, in addition to Automatic Emergency Braking, includes available Intelligent Cruise Control (ICC), Intelligent Around View® Monitor (I-AVM), Blind Spot Warning (BSW) and Rear Cross Traffic Alert (RCTA). Standard safety and security features include Nissan Advanced Air Bag System (includes dual-stage front supplemental air bags with seat belt sensors and an occupant classification sensor), 3-point front seat belts with pretensioners and load limiters, supplemental front seat-mounted side-impact air bags, roof-mounted supplemental curtain air bags with rollover sensor for side impact and rollover head protection for outboard passengers in all three rows, 3-point seat belts for rear seat occupants, including 2nd row center position, LATCH (Lower Anchors and Tethers for CHildren) – 2nd row outboard seating positions only, child safety rear door locks, Vehicle Dynamic Control (VDC) and Traction Control System (TCS). The 2019 Pathfinder comes in four well-equipped models, starting with the Pathfinder S with 284-horsepower 3.5-liter V6, Xtronic transmission and available Intelligent 4x4 (I-4x4) 4WD system. Standard features include Automatic Emergency Braking (AEB), Rear Door Alert (RDA)4, NissanConnect with 8.0-inch color display, HD Radio, SiriusXM® Satellite Radio2, Bluetooth® Hands-free Phone System, EZ Flex Seating System™ with LATCH AND GLIDE™, Tri-Zone Automatic Temperature Control, Push Button Start, six USB ports, RearView Monitor, Rear Sonar and Advanced Drive-AssistÔ Display (ADAD). Pathfinder SV models add a range of features including Nissan Intelligent Key®, 8-way power driver's seat, leather-wrapped steering wheel and gear shift lever, fog lights, auto-dimming rearview mirror with HomeLink® Universal Transceiver, Remote Engine Start4, Intelligent Cruise Control (ICC), Blind Spot Warning (BSW), Rear Cross Traffic Alert (RCTA) and much more. Pathfinder SL models include NissanConnect with Navigation and Services1, NissanConnect Services powered by SiriusXM®2, leather-appointed heated 1st and 2nd row seats, 4-way power front passenger's seat, driver's seat 2-way power lumbar support, heated steering wheel, LED headlights, Motion-Activated power liftgate with liftgate position memory and Intelligent Around View® Monitor (I-AVM) among other features. Pathfinder Platinum models offer unique 20-inch machined aluminum-alloy wheels, 235/55R20 tires, Bose® 13-speaker premium audio system, cooled front seats, woodgrain finishers, Dual Panorama Moonroof, Trailer Tow Package and more. Several option packages are offered for 2019 along with the new Rock Creek Edition. The SV Rock Creek Edition Technology Package includes NissanConnect with Navigation and Services, SiriusXM® Traffic, NissanConnect Services powered by SiriusXM®2 (SiriusXM subscription required, sold separately), heated cloth front seats, heated steering wheel and heated outside rearview mirrors. The SL Rock Creek Edition Premium Package features Bose® 13-speaker Premium Audio System and Power Panorama Moonroof with one-touch tilt/open/close controls (front), sunshade, rear roof glass with power sunshade. The Nissan Mobile Entertainment Package, available on Platinum grade, adds the dual 8.0-inch headrest DVD/Family Entertainment System with rear seat wireless headphones, wireless remote control, rear headphone jacks with volume control, USB port and HDMI jack. Ward's Segmentation. 2019 Pathfinder vs. latest in-market Large Cross/Utility Vehicle class competitors. Towing capability varies by configuration. See Nissan Towing Guide and Owner's Manual for additional information. Based on manufacturers' websites. SiriusXM® subscription required, sold separately (after applicable introductory period). Do not perform slide forward function with the Child Restraint System occupied. CITY, HIGHWAY and COMBINED: 2019 EPA Fuel Economy 20 mpg city, 27 mpg highway and 23 mpg combined for 2WD models; 19 mpg city, 26 mpg highway and 22 mpg combined (21 mpg Platinum) for 4WD models. Actual mileage may vary with driving conditions – use for comparison only. Pathfinder, one of Nissan's best known and most popular nameplates in its 60-year plus history in the United States, continues to offer a unique combination of rugged design, powerful performance, easy access for all seven passengers and a long list of standard and available innovative features and advanced technologies. It's the perfect way for families to turn up the adventure, around town or on and off the road. The big news for the 2019 Pathfinder is the introduction of the new Pathfinder Rock Creek Edition, a special value option package offering unique exterior and interior treatments that emphasize the rugged Pathfinder heritage. It is offered on Pathfinder SV and SL grades, in both 2-wheel and 4-wheel drive configurations, with two additional equipment packages and in a choice of seven available exterior colors – allowing buyers to customize their Pathfinder to their precise tastes. Key differences between the Rock Creek Edition and standard 2019 Pathfinders include unique dark 18-inch wheels with unique 255/60R18 all-season tires, black mesh grille, black roof rails, black door handles and outside rearview mirrors, black front and rear fascia accents and license plate finisher, black molded overfenders, and black model, grade and 4WD badges (if so equipped) and unique "Rock Creek" badging on the front doors. In addition, the new SV Rock Creek Edition Technology Package includes NissanConnect® with Navigation and Services, SiriusXM® Traffic, NissanConnect Services powered by SiriusXM®2, heated cloth front seats, heated steering wheel and heated outside rearview mirrors. The new SL Rock Creek Edition Premium Package adds Bose®3 13-speaker Premium Audio System and Power Panorama Moonroof. All 2019 Pathfinder models continue to offer standard Automatic Emergency Braking (AEB) and Nissan's innovative Rear Door Alert (RDA)4 system, which can help remind customers of items that may be forgotten in the rear seat. All Pathfinder models are equipped with a 284-horsepower 3.5-liter V6. The engine's Direct Injection Gasoline™ (DIG) system provides better wide-open throttle performance and emissions performance (versus a non-direct-injection system). Torque is rated at 259 lb-ft. The standard Xtronic transmission includes D-Step Logic Control, which simulates shifts, giving a more natural acceleration feeling. Pathfinder also features selectable 2WD, Auto or 4WD Lock modes from the available Intelligent 4x4 (I-4x4) 4WD system. Pathfinder's refined exterior provides a strong sense of adventure character and presence and features Nissan signature design elements such as the "V-Motion" grille and boomerang-shaped headlights with LED daytime running lights. LED headlights are standard on Pathfinder SL and Platinum grade. Other available exterior features include fog lights, outside rearview mirrors with integrated turn signals and 18-inch and 20-inch aluminum-alloy wheel designs. An available Motion-Activated liftgate with liftgate position memory is standard on SL and Platinum grades. A simple wave of the foot under the center of the liftgate activates the power opening function. 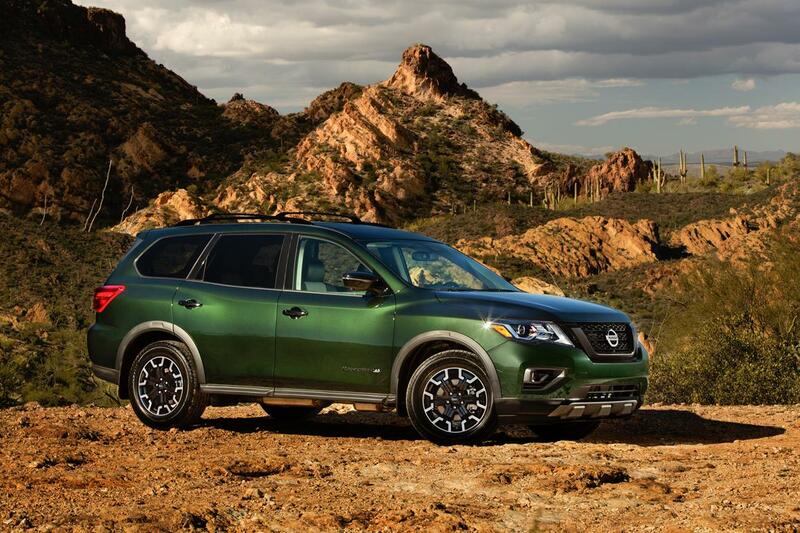 Pathfinder's stylish, adventure-ready interior includes comfortable seating for seven. Every 2019 Pathfinder interior is anchored by Nissan's innovative EZ Flex Seating System™ with LATCH AND GLIDE™, a 2nd row tilt and glide seat that allows easy 3rd row access with a child safety seat still installed5. A wide range of seating and cargo carrying combinations are available with the 2nd row 60/40-split seat with manual slide/recline/fold flat and 3rd row 50/50-split seat with manual recline/flat fold. Cloth seat fabric is standard for S and SV grades, while leather-appointed seating is standard on SL and Platinum models. Heated and Cooled front seats, heated rear seats and heated steering wheel are also available. Available Pathfinder information technology includes a standard Advanced Drive-Assist™ Display (ADAD), located in the center of the instrument display between the tachometer and speedometer. The standard 8.0-inch touch-screen monitor, mounted in the middle of the instrument panel, provides intuitive interaction and control of a variety of driver-selectable vehicle systems and settings – including the available NissanConnect Navigation. The available NissanConnect Services powered by SiriusXM®2 features automatic collision notification, emergency call and stolen vehicle locator, customizable alerts, dealer service scheduling and maintenance alerts. The 2019 Pathfinder's wide range of available convenience features and driving aids also includes standard Bluetooth® Hands-free Phone System, SiriusXM® Satellite Radio2, Tri-Zone Automatic Climate Control, RearView Monitor, and available 13-speaker Bose® Premium Audio system, Mobile Family Entertainment Package with dual headrest 8.0-inch DVD monitors, Nissan Intelligent Key® with programmable settings, Remote Engine Start6, Dual Panorama Moonroof and Easy-Fill Tire Alert. Advanced Driver Assistance technology includes Automatic Emergency Braking (AEB), Intelligent Cruise Control (ICC), Intelligent Around View® Monitor (I-AVM), Blind Spot Warning (BSW) and Rear Cross Traffic Alert (RCTA).